Children can use graphic organizers to help form and organize their opinions on a given text. Children have a lot to say and enjoy sharing their opinions. Forming opinions is a skill that also helps children with their reading comprehension. It’s important to teach children how to think about their reading, and part of that is showing them how to form opinions about what they’ve read. 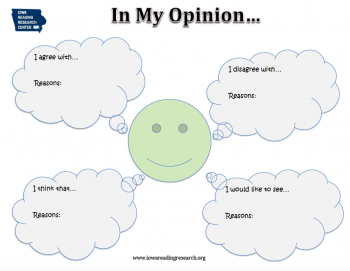 This Forming Opinions Organizer is a tool to help children organize their thoughts and learn how to form opinions about their reading. In addition, the organizer provides space for readers to record the reasons for their thinking. These reasons should be the evidence taken from the book that supports the child’s thinking. This means that opinions are not based on personal experiences, but on an understanding of the information presented in the book. I recently used the organizer with my children, and it provided the chance for some great discussion. Best of all, the children were able to see how words from the book helped us to form our thinking. My children enjoy the Berenstain Bears series and usually have a lot to say about the stories. I thought the graphic organizer would fit nicely with a Berenstain Bears book. Typically in a Bears story, the children or Papa makes a mistake or has a problem that needs to be solved. The bears also typically learn a lesson from the problem. These stories give a lot of chances for my children to form opinions about the bears’ behavior. Before we began reading, I shared the organizer with my children. I read the sentence stems and told them we would stop and form opinions as we read. I did have to remind the children to tell me which part of the book helped them form their opinions—what their evidence was. After we jotted down the opinions and the reasons, I had them read what they wrote back to me, using the word “because” as a link between the opinion and the evidence from the story. For example, on the organizer, Ryan had written, “I agree with Mama bear that sister is not being a good sport.” Her reasons were “sister brags and dances too much after she wins.” So, I connected them and restated her responses as, “I agree with Mama that sister is not being a good sport because sister brags and dances too much after she wins.” Next, I asked her to repeat the linked sentence after me. This reinforced the connection between her opinions (her thinking) and the words from the book. Learning how to form opinions and support them with evidence from the book is an important skill for young readers to master. The Opinions organizer is one tool to help your children learn to make opinions and organize their thinking. Download this and other graphic organizers here.